March 2007, Hong Kong Dance Alliance was invited to participate in the Beijing Modern Dance Summit 2007 and to organize four Hong Kong small-scale dance companies to perform in Beijing in July. After several months of preparation, part of the event evolved into a "Hong Kong Cultural Series". The companies that visited Beijing were Unlock Dancing Plaza, why_me_dance, and Passover Dance Company. The three companies, with a total of 15 persons, including choreographers, dancers, technical coordinator, lighting designer, and stage assistant, visited Beijing from four to six days, in the period from 4 to 11 July 2007. The three companies each presented one performance, gave a dance workshop, and participated in a Meet-the-Artists session. 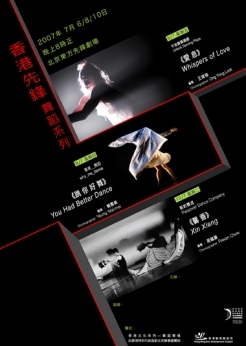 This project is the first time that Hong Kong small-scale dance companies toured to Beijing, and it is very important for Beijing audiences to understand the modern dance development in Hong Kong, and to fully understand Hong Kong dance, arts, and culture.